I’m making a pair of socks for a friend, and I wanted her to have a say in the design. The yarn had to be wool-free, which means Crystal Palace Panda Cotton or Panda Soy. The design came down to picking between various components. There are four types of cuff I like to make: plain hemmed, picot hemmed, rolled top, and ribbed top. The hemmed tops require a top-down sock, the others can go either way. All my BFL socks have a rolled top, my first rolled top was the Boudica socks from MimKnits which I loved until a moth got them. The sock recipient eliminated the hemmed tops which means I can do a toe-up sock. I prefer doing toe-up, but I do love the plain hemmed top. There are two choices for the heel: the short row heel, and the heel flap. Both can be done toe-up or top-down. For this pair, she chose a heel flap with eye of partridge stitch for reinforcement. 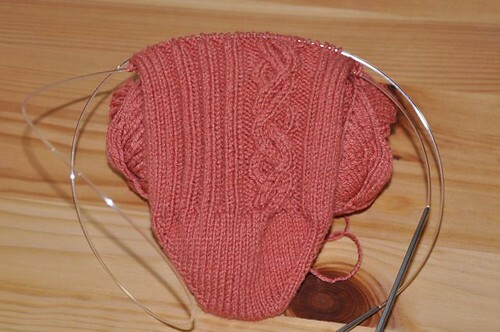 I’ve been using a toe-up heel flap pattern (PDF link), but following it can leave a small gap on the side at the top of the decreases that I’m working on eliminating. Once I have a few inches of the foot done, there will be a fitting session to make sure the sock isn’t too loose or too tight. I keep notes in a design notebook so a second sock, or a second pair, will be easy.